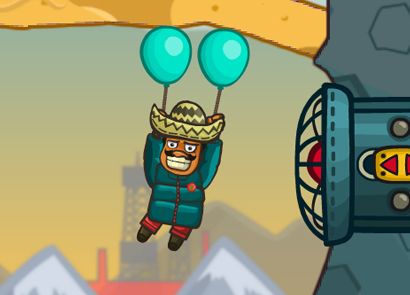 Pancho, a Mexican guy with a large moustache in pursuit of the best tacos, has somehow ended up inside a giant canyon and now the only way to escape this canyon is by using the two balloons he has and fly his way out. But apparently, the canyon seems to be filled with cactuses, bandits and bats who are very dangerous as well as many obstacles. 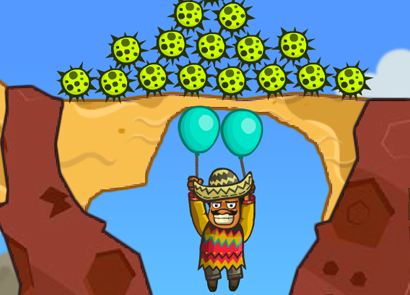 Pancho must avoid these bandits, bats and cactuses as he does not have a way of fighting back. 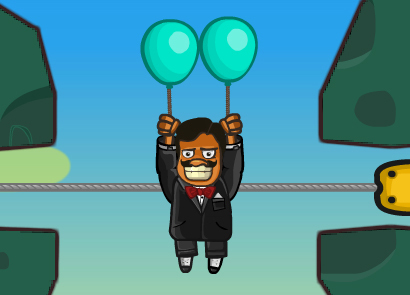 The controls in the game are very simple, you only need to click the obstacles to remove it, but some obstacles cannot be removed.The best way to win the game is to use remove the obstacles in the right manner. 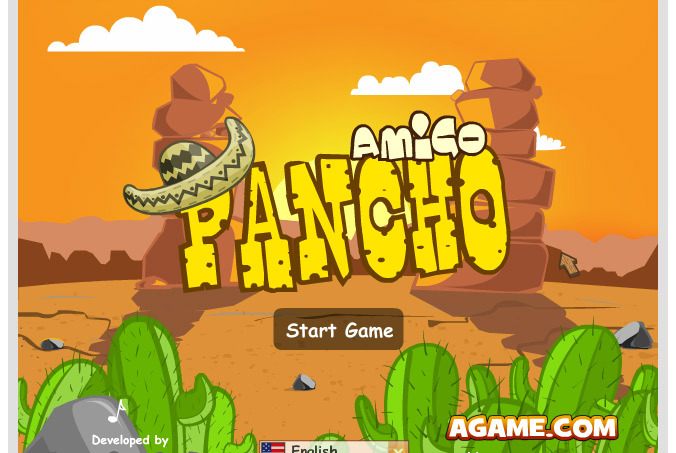 Amigo Pancho is a game which brings puzzle a new style, which requires, crucial planning and the construction of a perfect strategy in order to proceed to the next level. The game do not require any timing or any rush, unless you are keeping score. 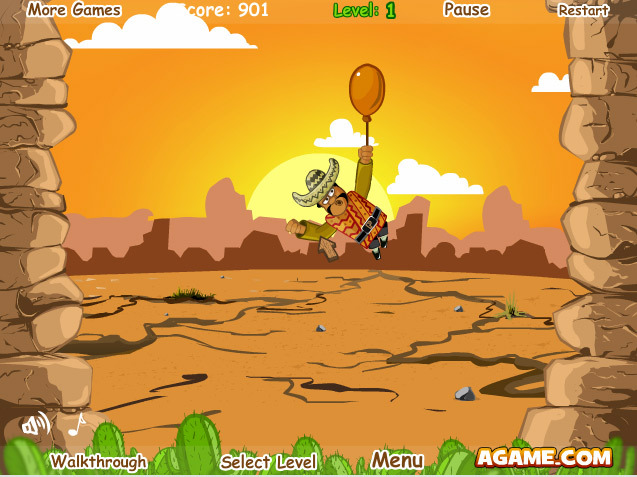 The main objective of the game is get Pancho out of the giant canyon that he is stuck in, by removing the obstacles properly in order to make way for him to fly away with the two balloons in his hands to the next level. Easy – The first seven levels are marked easy as they require minimal skill to unlock each of them, which are appropriate for beginners. Normal – After unlocking the first seven levels, a set of eleven levels from level 8 to level 18, are marked as normal, the difficulty of these levels are more as they require more skills and strategy to unlock the next levels. 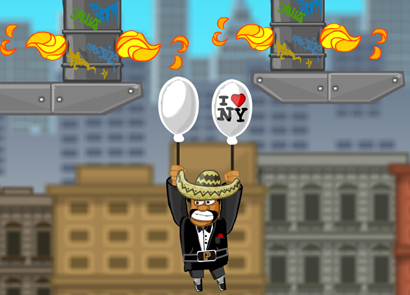 Hard – As you progress further the game changes to nighttime, the last set of levels from 19 to 25 are marked as hard as they are quite difficult, as the levels have various obstacles and some of the levels requires you to remove the obstacles quickly before Pancho runs into one. 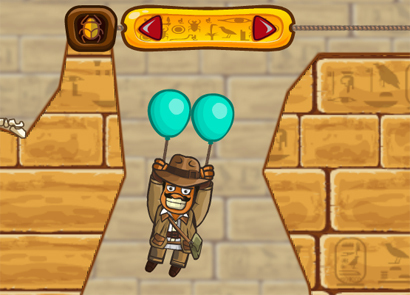 There are several type of obstacles in the game which can be discovered while progressing through each of the levels. Wooden beams and/or crates – These are basic path blockers which prevent Pancho from rising further, the beams and crates serve a major purpose in both providing a safety shield for Pancho and also can change the direction of other obstacles from Pancho’s way. Cactuses in sunglass – These cactus are quite dangerous as they repeatedly shoot out thorns, you would have to be very careful to go past these guys. Bats – There are quite a few giant bats in the canyon that Pancho is stuck in, these bats can be quite dangerous, so avoid them at all cost. 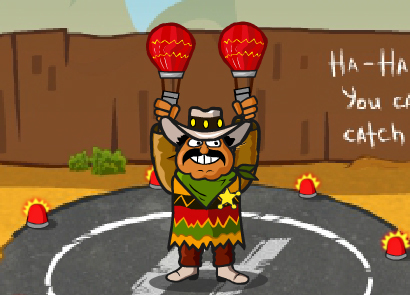 Cannons – There are some cannons in the canyon as well, these shoot out cactus as well, make sure to turn them around or else Pancho will not make it to the top. 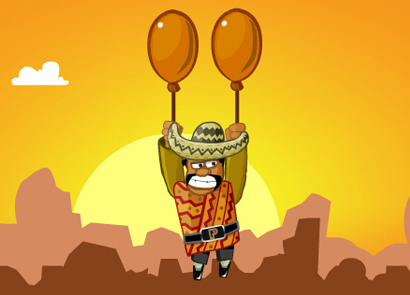 Apart from these, there are many other obstacles in the game by using each of these against each other you can prevent Pancho’s balloon from popping.